A heartwarming rendition of Going Home, by The Cathedrals. 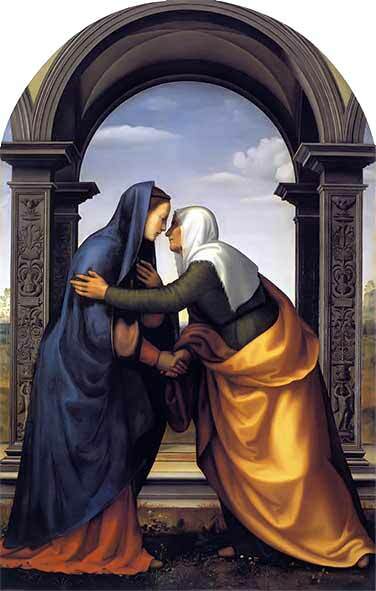 Mary and Elizabeth (Albertinelli ca. 1503). Likewise, wives, be subject to your own husbands, so that even if some do not obey the word, they may be won without a word by the conduct of their wives, when they see your respectful and pure conduct. Let your adorning be the hidden person of the heart with the imperishable beauty of a gentle and quiet spirit, which in God's sight is very precious. If Peter's entreaty to servants in yesterday's lesson is unpopular, today's passage is often downright reviled. In secular Western society, the liberation of women is considered a primary tenet of morality. Any hint that a woman should "be subject to her husband" is met with fierce opposition, anger, and even hatred. Moreover, marriage is difficult, and one of the greatest difficulties is power and control. The last thing a woman actively engaged in an interpersonal power struggle wants to hear is "give in". She, as much as her husband, has ideas about how things should be done; often her ideas are better. And yet, there is Peter's teaching, in black and white; what do we make of it? The first thing we must remember, always, is that this passage is addressed to women. It is not intended to give husbands rights, and it is not intended to be a law that husbands or society can impose. The matter is entirely between a woman and God. If one has read the preceding chapters of 1 Peter, one understands a Christian perspective in which Peter makes this difficult-sounding admonishment. We are all, male and female, rich and poor, masters and servants alike, a "holy priesthood" of Christ. A primary rule of our lives is that we should live like Christ: we must "abstain from the passions of the flesh" — in this instance, pride — which wage war against our souls. As such, once we decide that the great goals of our lives are our personal salvation and the salvation of others — surely, the greatest love we can show to another is to lead them to Christ — worldly passions become, at best, secondary; and at worst, a barrier to our goal. If we offer our very lives to a painful crucifixion, as Peter did, other matters become mundane, petty, trivial. We strive to concede unimportant issues, lest they block the single great issue of bringing the world to Christ. Finally, I must point out that there are many Christians, some of them more devout and knowledgeable than I, who state that this passage must be read in the context of history and is not applicable to modern Christians. I am personally reluctant to discount or reject any part of the New Testament, including this one. My philosophy is that I have no authority to pick the parts I believe in, for I am afraid that I will be tempted into believing only passages that are convenient for me. Nevertheless, I repeat: This matter is entirely between a married woman and God. I would urge that all people who confess Christ as their savior not to allow issues such as gender roles to interfere with their love for their brothers and sisters.